After un-boxing my new Garmin last night, I exitedly pulled out each element of the package and was sure to connect it to a power source for its required 3 hours of initial charging. I left it overnight, so first thing when I woke up, I hopped out of bed to start playing around and learning all I need to know for enhanced running geekiness. Since I slept in (til 8 AM) and then dilly-dallied around most of the morning, I didn’t get out for my ‘test run’ until early afternoon – and since I did my long run Saturday, I decided that I’d run just a mile to test out my new gear. I was going to just head out with the Garmin (no cellphone, etc) but hubs suggested I take both out (my iPhone has the Nike+ application, which I depended on a lot when I first started running) to see if the data matched. Challenge accepted! I carried the iPhone in my iFitness belt, and therefore there is a several second delay for the data since I had to switch it on, then stow the device before starting/ ending the run. 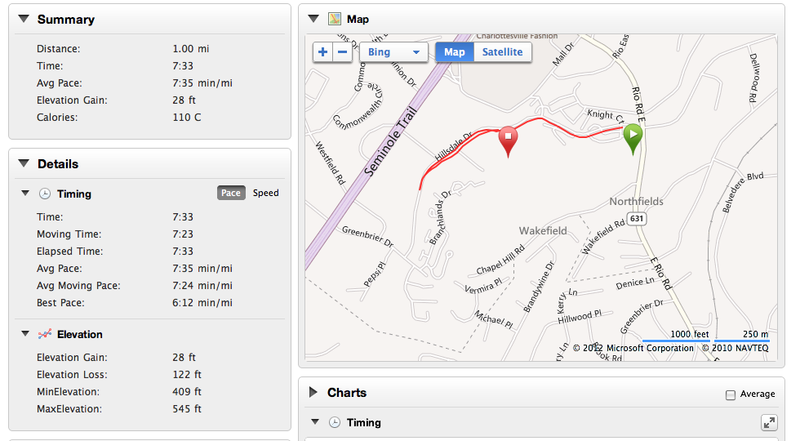 I was already somewhat familiar with the Garmin Connect software, as my previous watch was the Garmin FR60, a sans-GPS running watch – so this addition of seeing my course mapped out was pretty cool – not to mention the Elevation data! As you can see, I chose a nice downhill slope, hit a turnaround (conveniently it was where the sidewalk literally ended) and proceeded back up until I saw 1 mile on the screen. The map of course, checked out as well. I know that for a more accurate test-out, it’d probably be more beneficial to do more than a mile, but I have to say that in my totally un-scientific mission today, I was pretty impressed by the accuracy of both instruments. This might beg the question – why would you then get a $100+ watch when you can get similar results from a $2 application? Well, good question – and depending on your individual situation, this could be a useful discussion to have with yourself. Anyway, it definitely is nice to have options when it comes to tracking running workouts. I am excited to see how this new piece of technology enhances my training. Do you think technology helps/hinders your running? 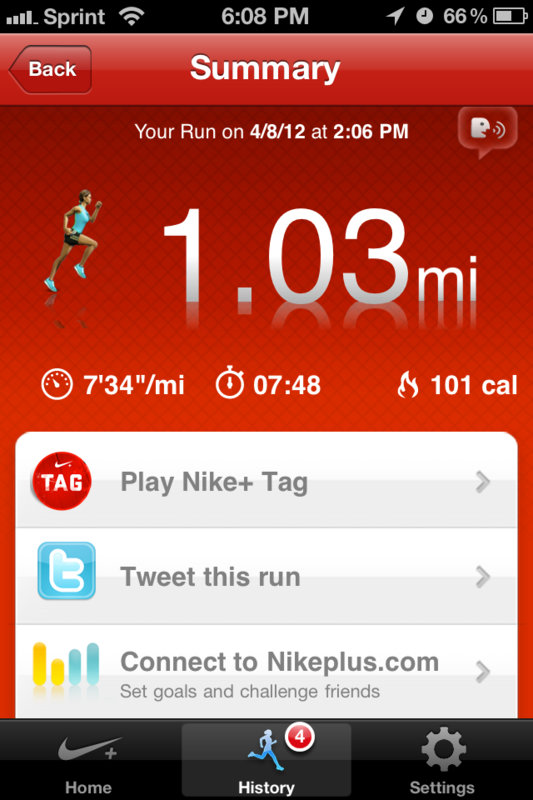 I have always wondered about the Nike + .. thank you for a nice comparison to the Garmin. 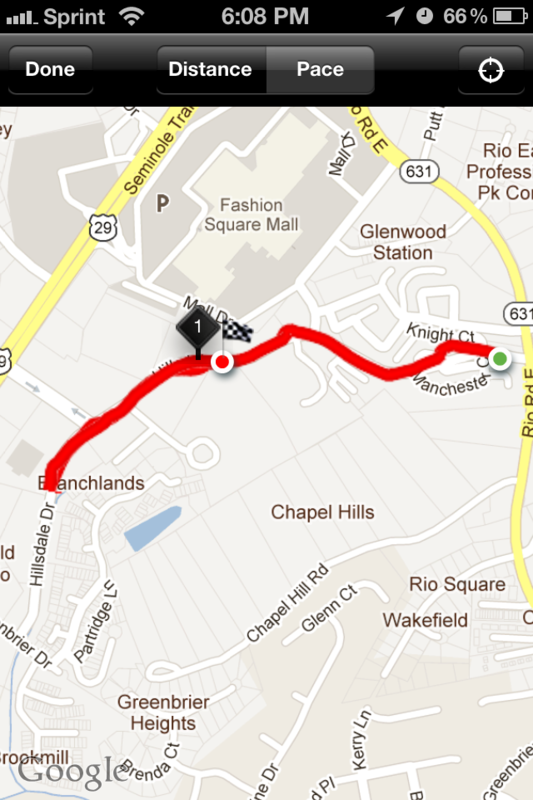 I went from Nike+iPod (not the GPS version) to a Garmin and haven’t looked back. Well, I still use Nike+ for treadmill runs. The Garmin is hands down better. It is customizable to show you what you want to see (on the watch and in Garmin Connect). But then again, I am a self-professed data diva. Give me lots of data and I am a happy camper. Also, I have the foot pod from my past Garmin (FR60) so I used the Garmin sans GPS today and it was awesome!!!! I also went from using Nike + to a Garmin and have to say that I prefer my watch as the primary data source.Nike+ is limited in the amount of data it provides like no elevation, split info, or heart rate. I especially like knowing my splits during a race to see where I started to slip. 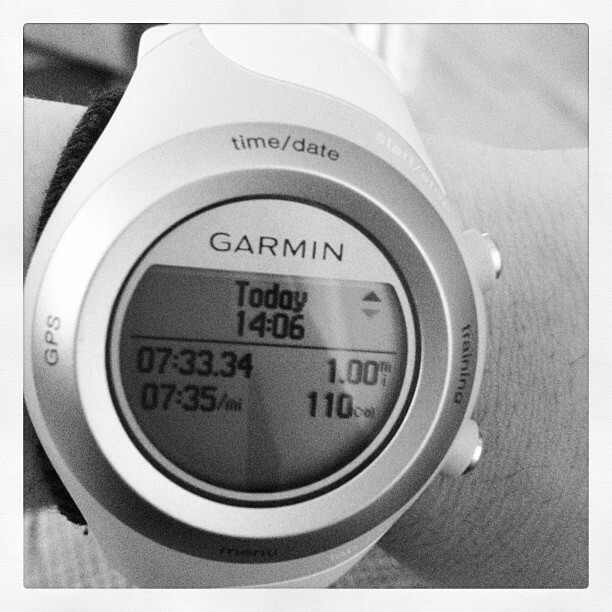 Garmin has its cons too like how it doesn’t have the talk to you during the run. Maybe they’ll include this feature in the future?? I can dream right? heck while I’m at it, how about a holographic running partner beamed out of the watch to keep you on pace?? I like that holographic running partner idea! Garmin’s technology is, so far, just superb. The satellite receiver gets a signal from satellites every 4 seconds, so that means it will rarely cut corners. Most apps I’ve seen and other GPS watches do not ping that often, and they cut corners or lose their satellite signal much quicker when blocked. Good to hear another voice on the matter, David! I am loving the Garmin so far! !